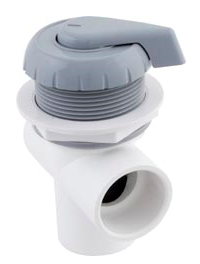 Hydro Air 1 Inch Diverter Valve 11-4020GRY Gray is now made by Balboa Water Group and is a 2 port valve to connect 1 inch inner diameter flex hose or pipe. Available in 2" and 1" sizes topside mounted easy to turn, allows for zoning to banks of jets and permits variable flow to different areas. This one is 1 inch in gray. Hole size for 1" valve is 2-1/16"